Isn't it strange that consumers can need something so badly, and not even know about it? 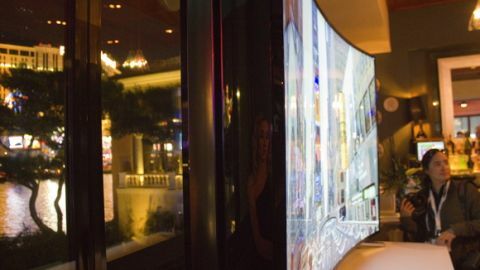 That's the case with Samsung's latest innovation, a flexible, "bendable" Ultra HD TV that the company unveiled at an event just before CES 2014 in Las Vegas. Samsung has made strides in the last year to transition from flat TVs to curved ones, and it's showing off some impressive curved displays at the convention this week. But the bendable UHD TV is both a flat and a curved screen in one advanced unit. It's a flat TV one moment, and a curved TV mere seconds later - and the transition appears to happen effortlessly. That's a very good question, and naturally it's one that we posed to Samsung's Vice President of Home Entertainment and Marketing Dave Das at the pre-CES event. "I think it's a really cool preview into what's possible in the future," he replied. Das explained that different degrees of curvature are ideal for various living room set-ups, depending how far viewers sit from the screen. The default curvature of Samsung's non-bendy curved displays is 4200 radii, and Das said that's ideal for viewers sitting three to four meters away from the units. But as Microsoft is learning with the mixed reception to the Xbox One's multimedia, entertainment and voice command capabilities, there is no one-size-fits-all solution for living rooms. That's a lesson Samsung may understand already. Das said users with odd or asymmetrical living room set-ups might want to bend just one side or the other of the new flexible TV, he said. And depending how far back users sit from the TV, they might want to adjust the curvature of the display even further. Like Samsung's other Ultra HD 4K displays, the bendy TV screen itself is just gorgeous. And there's no discernible dip in quality as it changes shape. It's very seamless. Looking at this unit, it's easy to see why Samsung feels justified in claiming it's at the forefront of TV innovation. "We believe that the future is curved UHD," Das said. "I think it stems, much like all of our other technology, from giving consumers the best possible viewing experience. "And based on our feedback from consumer research, and from our retail partners, they love curved. And so bendable is taking it one step further and really allowing the consumer to customize the degree of the curvature, and, again, depending on where they're sitting in the living room, striking that ideal balance." Samsung won't confirm officially whether this bendable TV will ever actually come to market, but Das expressed optimism that seemed to border on certainty. "We're showing the technology now so it could happen within the next year," he said. The concept of a flexible, bending TV sounds totally ridiculous at first, but when you hear Samsung explain it it makes perfect sense: different users may want different degrees of curvature, so why not let them customize it? That's really the point of this tech. Of course, that premise assumes that consumers want curved TVs to begin with, and that remains to be seen. Keep an eye on TechRadar's CES hub for all the news from the biggest tech show of the year!